Need a quick recap? Here are the most notable measures announced by ministers Howlin and Noonan today. IT WAS IRELAND’S seventh austerity Budget. We were warned it would be ‘tough’ – and it was. 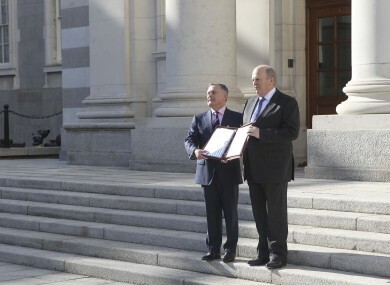 Finance Minister Michael Noonan revealed how his department plans to increase the nation’s tax take, while his colleague in the Department of Public Expenditure and Reform explained how he intends to help take €2.5 billion out of the economy. -No increases in any of the three tax categories. -Reduced rate of 9 per cent for tourism sector to be retained. -All other VAT rates are to remain untouched. -Reduced to zero per cent with an aim to encourage airlines to build new routes and traffic. -A new higher single unified rate of 41 per cent for DIRT and the exit tax that applies to life assurance policies and investment funds has been introduced. -The pension levy of 0.6 per cent will be abolished on 31 December 2014. An additional levy on pension funds at 0.15 per cent will be introduced during that time, increasing it to 0.75 per cent. -From 1 January 2015, the levy will be 0.15 per cent of the value of pension funds. -To be calculated at 13.5 per cent on works worth over €5,000 and under €30,000 on family’s primary residences in 2014 and 2015. -The Minister said Ireland is 100 per cent committed to its 12.5 per cent Corporation Tax rate. -However, the Finance Bill will be changed to secure Ireland’s reputation as being ‘part of the solution’ to the global tax crisis and not ‘part of the problem’. The change will ensure Irish registered companies cannot be ‘stateless’ in terms of their place of tax residency. -Any lump sums paid to survivors as part of a compensation scheme will be tax exempt. -From midnight, cigarette packets will be taxed 10 cent more. -Also from midnight, bottles of wine will be taxed an extra 50 cent more. -Meanwhile, and also from 12pm today, beer, cider and spirits will all rise in price by 10 cent. -Tax relief for medical insurance will be capped at €1,000 for adults and €500 for children. -The tax relief credits will be changed from the One Parent Tax Credit to a Single Person Child Carer Tax Credit. Only the primary carer, rather than both single parents, will be able to claim the credit which is of equal value to what it is replacing. -There will be no increase in excise duty on petrol or diesel. -There will be no increase in motor tax. -Irish banks will be expected to make an annual contribution of €150 million to the Exchequer annually. -The farmers’ flat rate addition is being increased from 4.8 per cent to 5 per cent from January. The scheme compensates farmers for VAT incurred on their farming inputs. -The Capital Gains Tax retirement relief has been extended to disposals of long-term leased farmland in certain circumstances so older farmers will lease out their land to younger men and women. -Any property sold next year will be exempt from Capital Gains Tax if it had been held for at least seven years. -The ‘Start Your Own Business’ Scheme will see those who are unemployed, and starting their own new business, exempt from income tax for two years. -The income thresholds for medical cards for those aged over 70 years old have been reduced to €900 for a couple and €500 for a single person. -Free GP care for all those aged under five years old will be introduced. The cost to the State will be €37 million. -Maternity benefit will be standarised to €230 per week for new claimants from January. Currently, it lies between €217 – €262 for women. -Per-item prescription charges are to increase to €2.50 per item – this charge began as a 50 cent levy in 2010. The monthly cap is €25 per family. -The total adjustment is €290 million. -The €100 reduced rate of Jobseeker’s Allowance and Supplementary Welfare Allowance to existing recipients who reach 22, and for new entrants aged up to 24 on or after 1 January 2014, has been extended. -Another reduced rate of €144 for jobseekers will apply to those reaching 25 from January next year. -The telephone allowance will be discontinued to save €44 million. -The number of waiting days for entitlement to Illness Benefit is being increased from 3 days to 6 days to save €22 million. -Child Benefit remains unchanged at €130 per month. -There will be some hiring next year in schools, hospitals and An Garda Síochána but the paybill will still be reduced by €500 million. -There are plans to hire 1,250 new classroom and resource teachers for the school system. -€5 million is to be allocated to extend the reach of the books to rent programme in primary schools. a number of 1916 Commemoration Projects. -€10 million will be provided for an unfinished housing estate resolution initiative. -€30 million of the lottery licence proceeds to recommence the State’s house building programme. -€9 million for the completion of the ‘one stop shop’ for Intreo offices to provide better services for the unemployed. -€14 million to a “Youth Guarantee Fund”, which will support additional activation places for people under 25. -The €850 once-off payment to bereaved families will be abolished to save €17 million. -The annual payment to RTÉ for the Free TV Licence will be reduced by €5 million. -The €230.30 weekly rate will be discontinued for those age 65 and aligned to the €193.50 currently paid to those under 65. -Irish Sports Council funding cut by €3.1 million. -Reducing funding for Irish Aid by €14 million. -Cutting funding to third level institutions by €25 million. Email “Budget 2014: the key things to know from today’s announcement”. Feedback on “Budget 2014: the key things to know from today’s announcement”.